So last night there has been a huge outbreak of Twitter drama with many ‘big’ Instagrammers being called out, with evidence of fake follower farming. I wrote about this a few months back and surprised it’s taken this long to become an uprising; people have been talking about this for years. I am not naming and shaming, because it’s not my place to and I think once the facts really start to be uncovered, it’s going to be a very, VERY long list. But why then? Why buy fake followers? This is not a new thing at all; I remember even seeing Google+ accounts buying fake followers (remember when Google+ was a thing?). Brands and their money seem to be dependant purely on a numbers game as genuine interaction and engagement are hard to track; particularly quality of engagement. and so this is the temptation of buying fake followers. If someone came to me and said “Look, I can get you 60K followers, 1K likes and streams of comments on each post, whilst I promise no one will ever know!”. I’d consider it. That’s being honest. I know what comes with having one of these mega accounts and when you’re not a hunky, ripped thirst trap, or a celebrity, it seems ne’er impossible to achieve these numbers. Free holidays, sponsorship and payment opportunities are colossal. Who wouldn’t be tempted? But what people forget is, the truth will always out. How can you spot a fake? There are many apps and sites out there that can measure the percentage of fake Twitter followers; these have been really useful in uncovering fraud. To date however, there has been no way to track the number of fake Instagram followers without delving through their enormous lists. 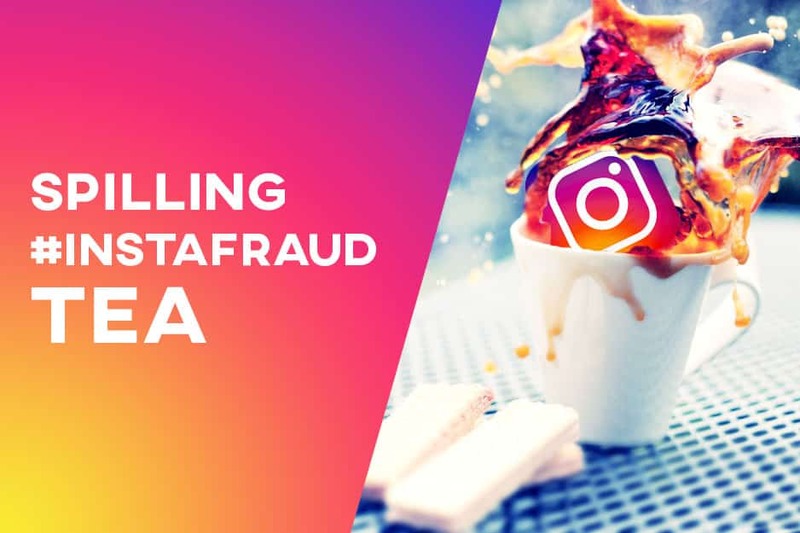 What has been uncovered though are follow and unfollowing habits as well as looking at the accounts some of these ‘big’ Instagrammers are following. Frustratingly, due to the number of followers and the twitter algorhythm, the number or fake likes and fake followers pushes these ‘big’ accounts up the timeline priority attracting a chunk of genuine engagement; muddying the waters a little. Socialblade has been banded as a great way for spotting this. Are they always intentionally faked? 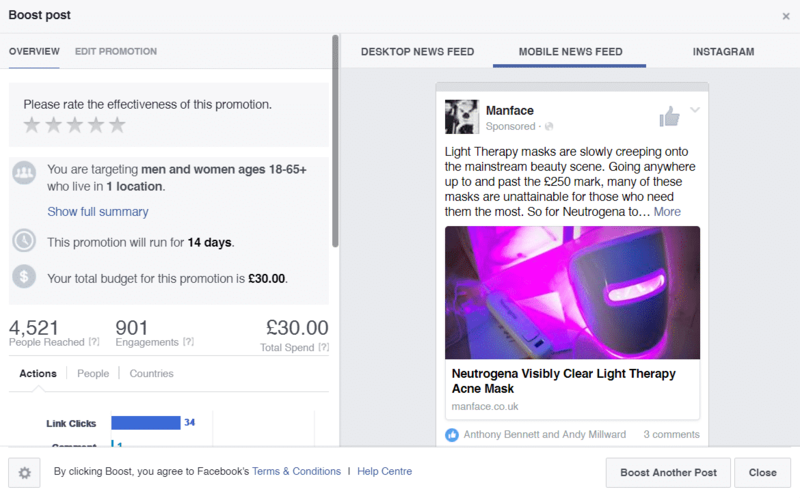 I was on my MANFACE Facebook page and suddenly got a popup from Facebook saying that they’d give me £60 advertising credit to push the post below. I’m not one to look a gift horse in the mouth so I filled everything in and off it went. Advertising is advertising. The above is a snapshot of the ad. It has a couple of likes and a few comments from the sponsorship. Nothing mega. But Instagram being part of Facebook, the ad was also pushed across that too. So from 3 comments and 2 likes on Facebook, it achieved 821 LIKES! How the hell does that make sense? It doesn’t. So I looked through all the likes and found the majority of them to be fake bots. Then things got even weirder. I suddenly received an influx of almost 2,000 followers on top of the 3,100 I had built up since Instagram had started all those years ago. I immediately assumed someone had bought them on my behalf in retaliation to how recently vocal I’d been on Instagram fakes – I even had an idea of who it might have been. However, the more I looked at it and thought about it; I’m pretty certain – I’d say 99% – that these have come as a direct result of that bloody Facebook Ad! The fabulous fashion and lifestyle blogger The Discerning Man (Ed) told me that sometimes this happens and then you’ll receive a direct message or email informing you of these fake followers and that you should pay a few dollars to keep them. He then told me how to get rid of them. I never received this message, but I did follow Ed’s advice, using a great app for Android called cleaner that allowed me to mass block followers; however this could only be done 80 at a time due to Instagram’s API access restrictions. I’ve pretty much got rid of them all after around 12 days of reminding myself. So this has made me SEVERELY question the viability of advertising on Instagram; something that I was very much considering as this isn’t buying followers, it’s just getting your content in front of genuine people who might like it and might not have heard of you before (or so I thought). This also should prompt you to do your research before slandering someone. When this all broke, I genuinely got a momentary twitch of nervousness because of this; however I knew it had happened when it happened and have been very vocal about it. I still think it’s pretty easy to spot a fake; but still, don’t risk a lawsuit. So OK, how do you build your following the right way? It’s all about creating engaging content and developing a rapport with your… ok, even I can’t keep a straight face here. Building a social media following is very, very difficult and not like maintaining a blog at all. It’s essentially speed dating. For Twitter for example, I use a great app called Crowdfire which I’ve used on and off for years. This can look at accounts similar to yours or who talk about similar things or even those who use similar #tags and show you the people who they follow. You can then follow these similar accounts from the app. I do this in small numbers, usually by looking at their bio and profile photos. Then once done, I’ll look through my timeline over the next few days and look for any that are worth keeping and following. If not, I just get rid of them. I like my timeline to be relevant and full of the people and tweets that I’m interested in – pure and simple! There’s a huge difference in doing this in small, thoughtful numbers and just MASS following 1,000 accounts a day and unfollowing those who don’t follow you back. That’s why I have such low follow/follower ratios: 3,324 followers on Instagram and only following 19; then on Twitter, following 290 and followed by 10.1K (I’ve used Twitter most, and since 2010 roughly). But if you do this carefully and selectively, it can get you and your content in front of people who might not have heard of you before, and that you’d get along well with. Some of the people I talk to very regularly on Twitter have been connected through me doing this. People forget, it’s all about building an interested following and genuine interaction. Then just make sure your content is relevant, reach out to people and comment on other people’s posts. The whole point of social media is to be social! Nothing. It took PR and Marketing departments years to realise blogging was important, then years to realise Instagram was important. They’re always way behind the times. They don’t care that the people they’re sponsoring have fake followers, because at the end of the day, as long as their marketing report shows a low cost and high exposure, it doesn’t matter. They’re just as much to blame as those buying the followers – it’s like druglords and crack dealers. Talk about it, share this post and others like it but just remember, do your research before naming and shaming because you don’t want to get yourself in any kind of trouble. I’ve already seen a few people wrongfully named and shamed in the last 24 hours; but thankfully, so many that were rightfully! This article first appeared on MANFACE written by Thom Watson. It was published on Monday 17th April 2017 and was last updated on Monday 17th April 2017 at 1:18pm. It's categorised under Editorials where you'll find more related content. It is about time but then again advertising isn’t about honesty, it is about manipulation. Yet, for those of us who work hard on creating content only to be poo-pooed by brands and such; it really does a number on the human psyche at times. As for the ones who get all the goodies via fake followers, karma is always right behind them. Not only that, these people also forget there are other people on the internet besides them who know better! Besides, instagram is big today, but what is going to happen tomorrow? I will tell you who has the biggest bunch of fake followers: Kim Jong Un!!! Amazing article! I am so glad that there are other bloggers who speak about that issue, and the whole facebook/instagram advertising is complete waste of time, I advertised one photo on Instagram once and all I got was 10 likes in the space of a week… Anyway. Thank you for talking about it! Keep it up! I’m completely confused about the Facebook ad bit where you suddenly got a bunch of fake Insta followers and had to employ an app to get rid of them. I would have been furious having to spend MY time getting rid of unaskedfor fake followers. WHY would Facebook give you fake followers? Does that mean Facebook is in cahoots with the #instafraud? (I know Facebook and Insta are the same company). Confused!!! I don’t for a second think Facebook is in cahoots (I’d be shocked if they were) but I think all that has to happen is the right bot sees it or targets Facebook ads and it all goes to pot. I’m still not 100% it wasn’t malicious, but it’s very, very suspicious it would happen during the ad being served. I hope I got your name right, if not apologies. I haven’t been following you for ages I must admit, but the beauty bloggers I do follow on Instagram number 4 including yourself. I had been looking for a trustworthy male blogger and when I saw that you were also behind Jane Cunningham, I knew I made the right decision. Thanks for all you do. It’s always wonderful to read your posts and I often go in search of products that you mention, in particular fragrance. I have staple scents but will always try something new. Hope you are having a good Bank Holiday Monday.